The Sage Grouse is the largest member of the Galliformes, the chicken-like birds of North America. 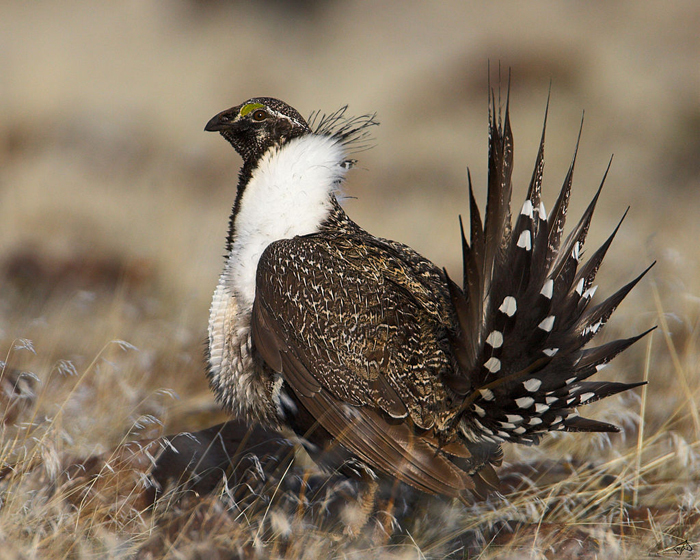 The Sage Grouse is beautifully adapted to the sage brush habitat of the desert west. In that habitat, it flourishes. A few decades ago, it numbered in the millions; today, by some estimates, the population is down to as few as 200,000 birds. There has been a 98% population decline since 1988. We are in grave danger of losing an iconic species of the west. The male Sage Grouse assemble for courtship rites in large groups called leks. Their drumming calls and dances are simply astonishing. 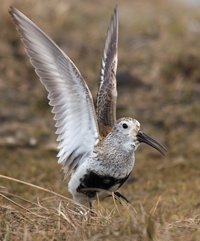 But the birds are vanishing with the sage brush habitat upon which they depend. A vast number of human factors are destroying the sage brush. Grazing and over-grazing, farming, mining, drought, invasive species and wild fire – all anthropogenic – are eliminating the habitat upon which the Sage Grouse depends. As a result, the Sage Grouse has been extirpated from British Columbia, Kansas, Nebraska, Oklahoma, Arizona and New Mexico. Much of private and public land in the West is leased or used for grazing. Cattle unavoidably alter the landscape; after all, they eat it, defecate on it and their hooves trample the desert floor. Cattle don’t prefer sage brush, and too much of it will make them sick, but when preferred grasses are gone, cattle will consume the sage brush. BLM, which leases much of the grazing land, is tasked with making certain that doesn’t happen, but the desert is vast the BLM’s resources comparatively limited. So that kind of overgrazing occurs, and the Sage Grouse loses. The coal mining and oil and bass tracking activities disturb and displace the Sage Grouse. The species does not tolerate noise well, and drilling and pumping oil, and drilling for gas, are noisy, industrial activities. The Sage Grouse loses again. Cheatgrass (Bromus tectorum), also known as downy brome, is an annual plant native to Eurasia. It is an aggressive, invasive weed that was originally introduced into North America through soils brought by ocean-going vessels. It’s now a dominant species in the Intermountain West. Cheatgrass has evolved to produce seeds early which are flame-tolerant. The dead, dry stands of plants are highly flammable, and burn hot, killing surrounding vegetation. Including sage brush. The seeds of the cheatgrass survive, and germinate early to again out-compete and native vegetation. The increasing CO2 levels in the atmosphere also increase the growth of cheatrgrass. Again, mankind’s activities hurt the ecosystem and therefore the Sage Grouse. The U.S. Fish & Wildlife Service was asked to classify Sage Grouse as an endangered species under the Endangered Species Act. After an intensive, exhausting process the Department of the Interior concluded that the Sage Grouse was not endangered. The conclusion smells political. BLM did protect some 173 million acres of sage grouse habitat and proposes to withdraw 10 million acres from oil and gas and mineral development. It also depends on a national fire strategy emphasizing protecting sagebrush habitat. WC says it smells political because it was a compromise because that let everyone dissatisfied. Idaho’s Governor Butch Otter intends to sue BLM for withdrawing all that land. Conservation groups intend to sue BLM because they disagree with the conclusion that Sage Grouse doesn’t qualify as an endangered species. And, in the meantime, in Idaho you can get a license to hunt the 2% of the remaining Sage Grouse. It’s not looking so good for this icon of the West. ← Gitcher Updated Program Here! Nevada has been cutting down a lot of the invasive juniper trees as part of their sage grouse plan. But they also famously overgraze all of the open lands, not to mention all the mining. I fear that what forward progress they made will be lost with a change of designation.